Yonder Mountain String Band’s 18-date spring tour includes shows with Horseshoes & Hand Grenades, Fireside Collective, and Dangermuffin. 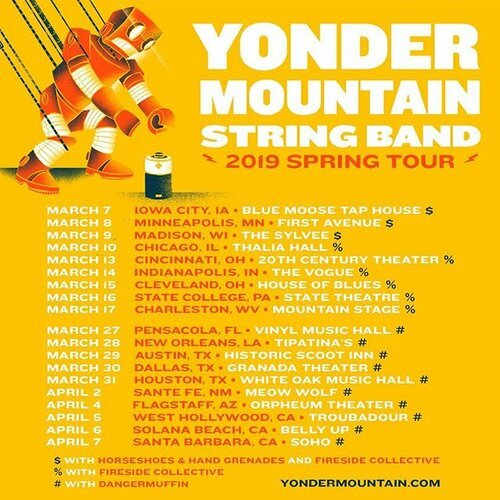 Perennial road warriors YONDER MOUNTAIN STRING BAND have announced plans for their Spring 2019 tour, which kicks off this March in Iowa and wraps in early April in Santa Barbara, CA. The acclaimed jamgrass band recently released-for free-the second edition of “Hines’ Finds,” a compilation of their best recent live jams, as curated by soundman Ben Hines. Check it out here. YMSB—Adam Aijala, Dave Johnston, Ben Kaufmann, Jacob Joliff and Allie Kral–formed in 1998 and have released 11 studio and live albums since, including three #1 Bluegrass Albums chart-toppers. Rolling Stone said Love. Ain’t Love is “an album rooted in modern bluegrass and punctuated by genre-jumping excursions into world music, reggae and all points in between” and premiered the video for the album’s first single, “Bad Taste,” here.